When you take one of America's favorite treats and cover it with one of the most well loved flavors the result is something extraordinary. 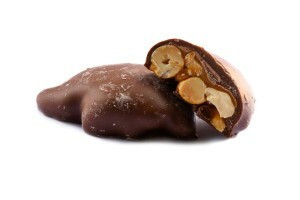 Our chocolate peanut gems deliver the phenomenal goodness you expect when you combine peanuts and chocolate. Delight your guest by including these gems on the party table. Keep some on hand to enjoy anytime. 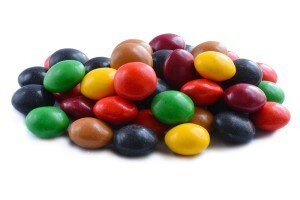 Semisweet Chocolate (Chocolate, Sugar, Cocoa Butter, Skim Milk, Peanuts, Lactose, Milkfat, Soy Lecithin, Artificial Flavors, Salt), Sugar, Peanuts, Cornstarch, Less than 1% – Corn Syrup, Dextrin, Coloring (includes Blue 1 Lake, Red 40, Yellow 6, Yellow 5, Blue 1, Red 40 Lake, Yellow 5 Lake, Blue 2 Lake, Yellow 6 Lake, Blue 2), Gum Acacia. One bag contains about 430-450 pieces. The Chocolate Peanut Gems are great! The Chocolate Peanut Gems taste great , and the price is very reasonable!